Ordering a UA with Reflex in a catheterized patient often yields false positives. This may result in the patient being identified as having a CAUTI (Catheter associated UTI) which is inappropriate in many of these cases. UAs with Reflex should only be ordered in catheterized patients if you clinically suspect a UTI. Otherwise, you should order a UA only. Starting 9/26/17, the UA with reflex order will be updated to include order specific questions regarding catheterized patients as shown below. 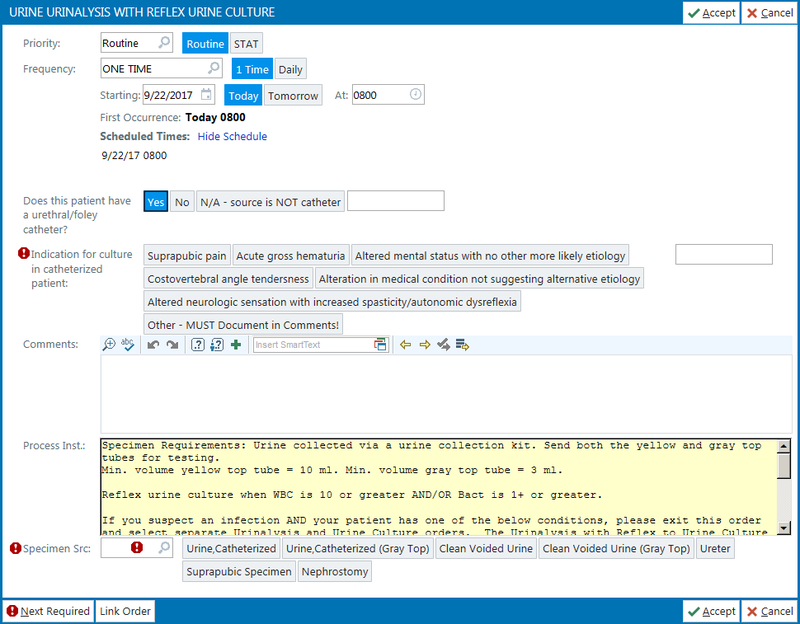 Specifically, if you state that the patient is catheterized, you must fill out the clinical indication(s) as to why a reflex to culture is needed. If none of the clinical indications apply, you should cancel the UA reflex order and use the UA without reflex order. Send your questions, thoughts, and ideas. Copyright © 2019 Connect the Docs. Powered by WordPress. Theme: Spacious by ThemeGrill.